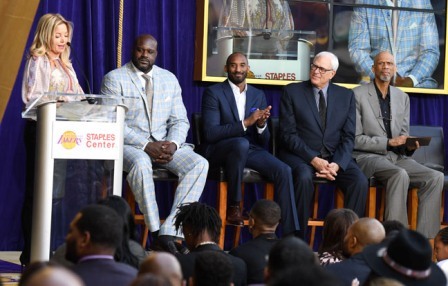 The Staples Center unveiled the statue of Lakers icon Shaquille O’Neal on Friday at a ceremony full of laughter, anecdotes, and appreciation. 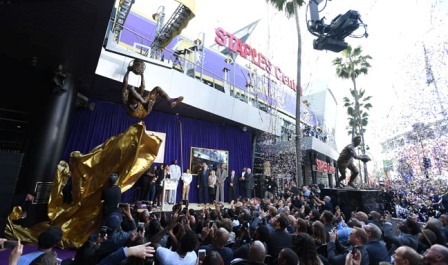 Lakers fans along with franchise greats and Shaq’s loved ones all bared witness to the début of the eighth Staples Center statue. “Can you dig it?” O’Neal yelled to the cheers of fans. His catchphrase echoes in the nostalgic minds of long-time Lakers fans from the ‘three peat’ era when he yelled it during championship parades. The statue is suspended in air, poised in the most exciting way to score in basketball: hands clinching the rim and legs kicked out, embodying one of Shaq’s revolutionary dunks. People near to O’Neal spoke to at the ceremony, from former co-workers like superstar Kobe Bryant and New York Knicks president Phil Jackson to his children. Chick Hearn Court at L.A. Live was transformed into Shaqtown, a fan fest full of carnival games, a ferris wheel and giant posters of O’Neal. 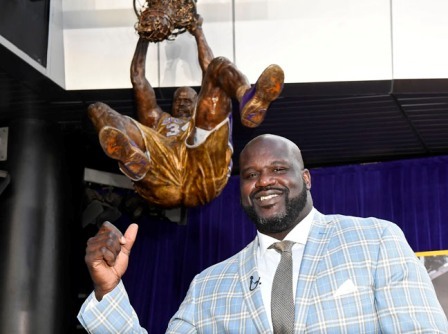 The two Lakers greats with statues, Magic Johnson and Kareem Abdul-Jabbar also shared their appreciation for Shaq’s contributions to the Lakers. Johnson could not make the event, but shared how Dr. Jerry Buss and Jerry West appointed him to recruit Shaq back when he played for the Orlando Magic. Jackson recalled how he challenged Shaq to play an average of 48 minutes per game, that resulted in Shaq winning league MVP honors. 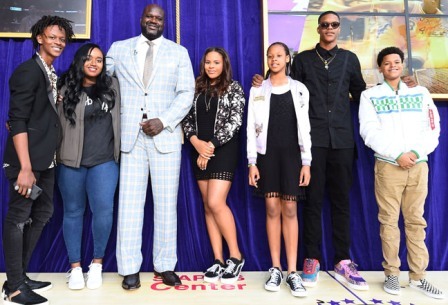 Bryant told Shaq’s children that their father “was a bad man,” calling him “the most dominant player” he had ever seen. In the audience were several players from Lakers championship seasons of yore: Robert Horry, James Worthy, Derek Fisher, A.C. Green and Rick Fox. O’Neal recalled memories with teammates like Brian Shaw, Horry, and Fisher. He mentioned James Worthy and Wilt Chamberlain were two Lakers players who also deserve statues. 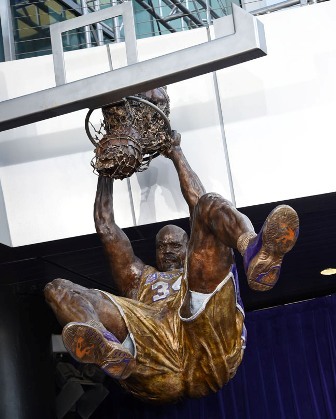 The dunk statue is symbolic, during his time in the NBA, Shaq’s powerful slams demolished glass backboards. The league had to adapt by building sturdier goal post with Plexiglas backboards to keep players safe. Shaq’s ability to break backboards brought stress to Zeidman, who was the Director of Operations at the Great Western Forum when was Shaq was traded to the Lakers. O’Neal thanked his family, mentors, teammates and fans for their support throughout the years.